Highlands vs. “Lowlands” Tequila: Does It Matter? Fans of the Highlands, also known as “Los Altos,” claim that the soil is richer, and so agaves grown there are sweeter and produce tequila that is fruitier-tasting. Proponents of the Tequila Valley often point out that the region has a better water supply and agaves grown there produce an earthier flavor. But, given that different production methods can produce wildly different tequilas, we wondered how much the Highlands/Tequila Valley debate actually mattered. That’s why we decided to conduct our own blind tasting experiment, pitting 3 Valley tequilas against 3 Highlands tequilas. We had 27 members of our Tasting Panel rate and comment on these tequilas without revealing the theme, or even what they were tasting. All of the tequilas were purchased directly from retail establishments. This was not a contest as to which of these tequilas are better than the others. The tequilas were selected by us because they are all high quality, and worthy of consideration by anyone who loves tequila. There were no dramatic differences between the two regions. Differences that were detected were subtle. Both regions had the same number of “fruity” tequilas; neither had an edge over the other in this category. Tasting Panel members did find more earth and floral aromas and flavors in Tequila Valley products, consistent with expectations of the region. Tequilas from Los Altos, according to our panel members, had more vegetal (grassy) qualities, which is not consistent with common expectations of the region. These grassy notes are most often attributed to products from the Tequila Valley. 18% of panel members consistently rated tequilas of a certain region higher than the other, but 82% indicated no preference at all. 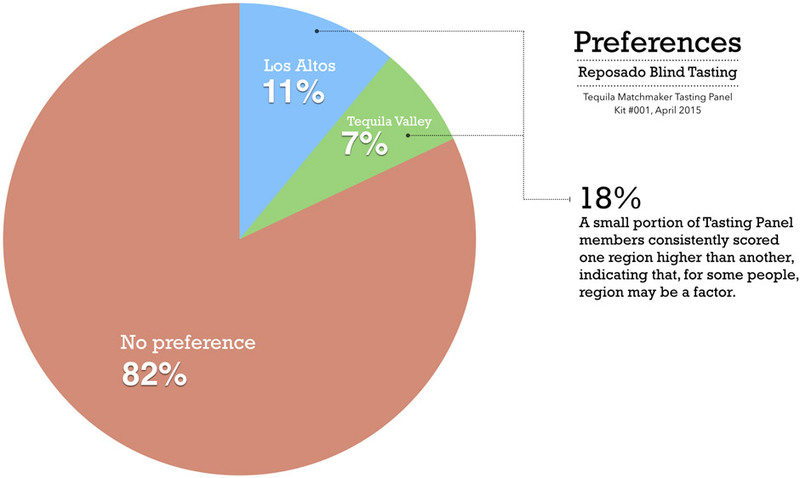 During our analysis of the results, we noticed that certain production methods influenced scores as much as regional influences did, indicating that how the tequila is made is just as important as where it was made. Half of the tequilas (Siete Leguas, Fortaleza, and Roca Patron) in this lineup use a tahona (stone wheel) to crush their agaves, while the other half (Casa Noble, Tapatio, and Don Lorenzo) use the more modern roller mill. The tahona-made products had a slight edge, on average, in scores related to aroma (+3%), flavor (+2.3%), and finish (+2%). 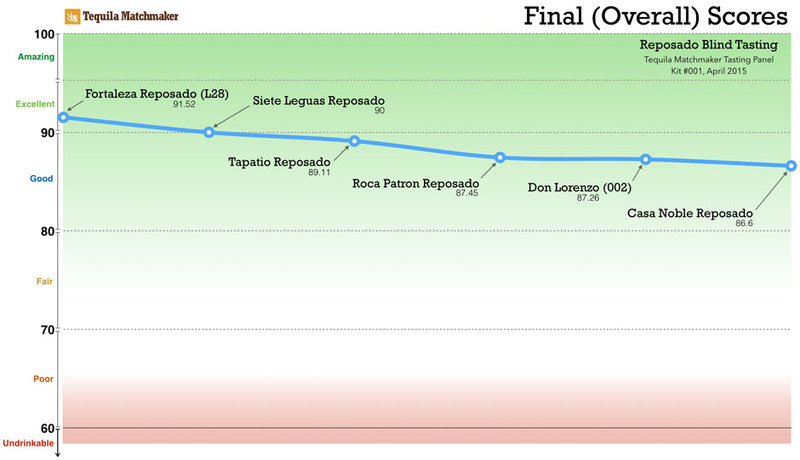 Tequilas that didn’t use a tahona scored higher in value (+6%), influenced greatly by the high value scores of Tapatio. Tahona products scored highest when the panel was asked if they would “Recommend to a Friend” (+9%), and if they would drink this again (+9%). When it comes to gender, the tahona process saw nearly identical scores (indicating that both genders responded equally favorable to it), but women rated non-tahona products higher (+5%) than men. 19% of panel members showed a consistent preference toward either tahona or roller mill, but 81% showed no preference at all. So, does the Highlands vs. Tequila Valley debate even matter? For a small segment of people, it does, but as it turns out, the production methods matter just as much or more. So, it’s not fair to judge a tequila simply based on where it is made. Although we were careful to select tequilas that source their agaves and distill their product in their same regions, this is difficult to determine with many products because agave can be sourced from various locations. You have to take all of the factors into account and see how it tastes to you. It is tempting for tequila lovers to look at region or production methods for clues about their quality, but in reality the production of tequila is much more complex. How a tequila maker uses the equipment can produce extremely different results with the same machinery. The age of the agaves used and how they are cooked can produce a different result from tequilas from the same region. Luckily, there’s an app for that! Try using the Tequila Matchmaker to help you discover the tequilas that are right for you, regardless of preconceived notions. That said, if you’ve always been a fan of a certain region, tell us what you think of the results of our blind tasting experiment and let us know if you have and ideas for future blind tasting themes. We plan to continue with these blind tasting experiments, once per month for a full year. The panel will get larger, leading to more comprehensive results. Users of the Tequila Matchmaker can be invited to join the Tasting Panel by using the app and meeting a set of criteria designed to identify the most passionate tequila drinkers in our community. If you’re interested, get rating! Very interesting comparisons…especially the outcomes!!. I find that 7 Leguas ( which is one of my favorite tequilas) has a very distinct agave flavor combined with a taste of soil, a subtle hint of iron,and a slight lingering of citrus flavors. I don’t really have a. Preference between the tequila Vally and the highlands. I enjoy both regions. However, my two “Go to” tequilas at the moment, are Fortaleza and 7 Leguas , which one is from the valley and the other from the highlands. :). Of course there is an abundant existence of good tequilas put there! The comparison was very informative. I enjoyed the presentation and I’m looking forward to the next comparison. Thank you for conducting this interesting study! I am curious though, why not use blancos? I would think blancos, without being aged in wood, would best highlight the terroir of altos vs valles. Yes, after we did this we had the same thought. I guess we will have to try this again using only blancos! It’s been four years since your video and a year and a half since your last comment…have you managed to do the blanco comparison yet? Nope, not yet. Right now is a bad time to conduct this test, though. Because of the agave shortage, many brands are sourcing agave from whatever region they can find — and what they are able to buy usually aren’t fully mature. We’re going to have to wait until the mature agave supply returns to normal before we can do an accurate comparison between the regions.